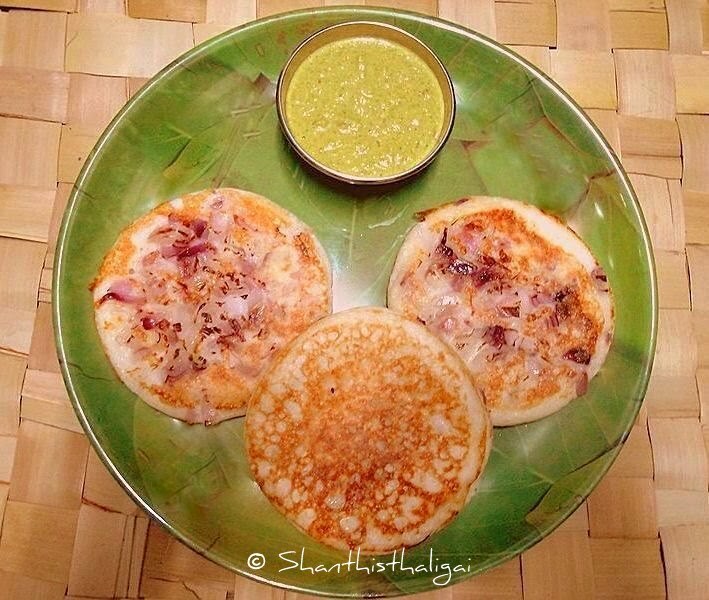 This is a simple to make south indian breakfast. NOTE: Use the above proportions, for uthappams with crispy outer layer, but soft and spongy inside. Plain uthappams without any toppings can also be made. Uthappams can be made with dosa batter also. OR any topping according to your imagination. Wash and soak rice, dhal and methi seeds together for 3 to 4 hours. Grind to a smooth batter adding little water. Add salt, mix well with hands and allow to ferment overnight. Mix the batter well. If it is very thick, add little water. Heat the dosa tawa , pour the batter to slightly thick, small circles. Do not spread. Sprinkle onions evenly. Alternatively you can use grated carrot and green chillies, mixed vegetables, coriander leaves and Dosai molaga podi. Drizzle a teaspoon of oil / ghee around the corners, cover with a lid and cook in medium flame until the base is golden brown. Flip to the other side and cook in low flame until done. This is my husband's fav. yumm..